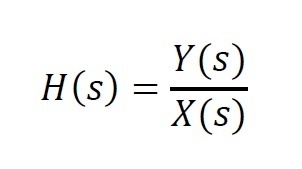 Transfer function H(s) is one of methods for creating dynamic model of system. In brief definition we can define transfer function as a Laplace transformation of output signal Y(s) divided by Laplace transformation of input signal X(s). Dynamic model of object in transfer function form H(s) is very comfortable because it links in one equation relation between input and output signal. Transfer function designation for mechanical system. System is built from spring and viscous damper which are connected in parallel. Input signal is force which makes system to change its position. Output signal is shift which system did. Shift is a difference between initial position and actual position. Mechanical system is constructed with mass m. Mass is on spring with stiffness k2[N/m]. Spring with stiffness k2 is connected in parallel with viscous suppressor B[N·s/m]. Spring k1 is connected to the mass from above. Input signal is a shift u(t) of spring k1. Output signal is a shift y(t) of mass gravity center. Motion equation for mechanical system is written. Next motion equation is transformed to Laplace operators form. Operators form of motion equation is used to designate transfer function H(s). Mechanical time constant appears in transfer function. 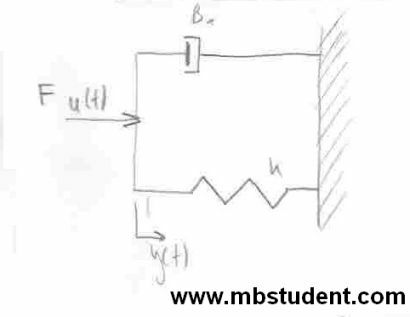 Designation of transfer function for electrical circuit. Electrical circuit is built from two resistor and one capacitor. Input signal is represented as input voltage.Output signal is represented as output voltage. 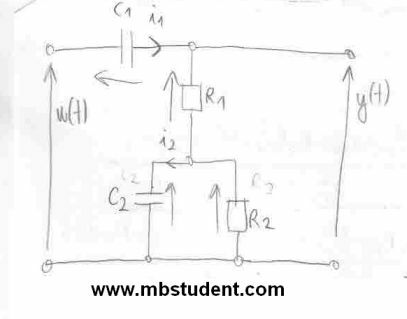 We will use branch current method to write equations for circuit in time domain. Next Laplace transformation will be used on received equations. 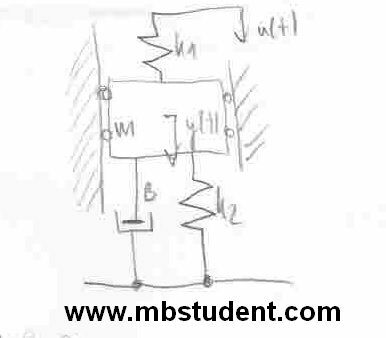 Designation of transfer function for electrical circuit. Electrical circuit is built from two resistor and two capacitors. Input signal is represented as input voltage. Output signal is represented as output voltage. 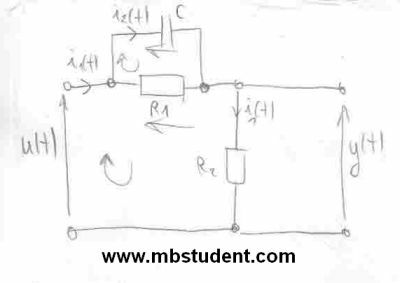 We will use branch current method to write equations for circuit in time domain. Next Laplace transformation will be used on received equations.